This is my last post on 52 Weeks of Guided Inquiry. I hope that it has been of some use to others. 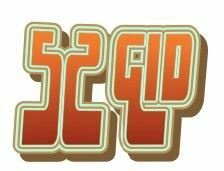 It has been fun to think/write about GID in this way and I’m looking forward to writing my final post. This post will be most like much of the writing I do on my own blog in that, as I write the opening to this post, I have a vague idea of where it will head, but blog reflections, to me, are more about working out my own thinking on a topic than anything else, so I don’t really know where I will end. I plan to move over to my own blog after this and follow up on a thread that Leslie and I touched on via Twitter this week on student thinking. That idea has been resonating with me and I’m looking forward to exploring it further. But, the meat of today’s post is around connections with GID from other places. I touched on the power of protocols within GID and I will explore that a bit more fully here. I also have done some research on making (i.e., the maker movement or makerspaces) and it’s relation to inquiry and I will introduce some of that here. I also look forward to introducing some challenges that I have had in using GID and hope that others can help me work through them. I have recently become exposed to the idea of using more regimented routines within my teaching to make certain kinds of thinking more visible or to focus students on a particular type of thinking. At first, I found these protocols to be artificial and overly restrictive as they typically focus thinking by restricting thinking in other areas. Over time, I realized that these structures are ultimately freeing and powerful. A simple example might be the popular Chalk Talk. This protocol/routine gets students to respond to a question written on a whiteboard, chalkboard (if you still have one! ), or chart paper. The students are only allowed to write their response. No discussion is allowed. The last time I used this, I divided the students into 3 groups to respond to 3 questions and I set a timer for the amount of time that they had on each question. The result is that the discussion occurs in a more visual manner with written statements being agreed to, connected to other ideas, or contradicted on the paper through the use of words, images, stars or checks (for agreement) and arrows. The discussion is powerful and recorded so that it can be reviewed later. There are many protocols that are good for exploring new ideas. The Affinity Protocol mentioned in my last post allowed students to explore very broad questions. In that particular experience, we had students answer our broad question, “What does it mean to be human?” post-it notes. They had to come up with ideas of what attributes humans have that distinguish them from other species. They did this individually and silently. They then took those notes and stuck them on a piece of chart paper and spent the next block of time sorting the notes, without speaking, in small groups into categories. It wasn’t until the sorting was done that they were allowed to speak to each other in order to come up with titles for their categories. Again, we restricted some forms of thinking and communicating in order to get the students to focus their thinking in a particular way. When the students presented their charts to each other, the explanation of what human attributes are and how they are organized allowed another view on the thinking and opened up all sorts of questions around a purposefully huge topic. Tuning protocols are also popular methods for people to get feedback on their work. Toward the end of the Create phase, I see an opportunity for students to present their work to each other within a structured routine to get feedback. 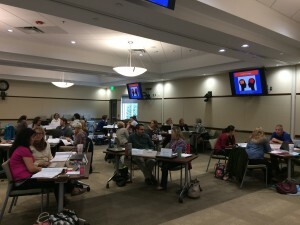 Without going into the specifics of this particular protocol, the routine focuses the feedback around a particular question that the presenter has about their work and structures the conversation around that work to be positive, focused and highly effective for the person presenting their work for critique. The protocols that I’m most familiar with are from the National School Reform Faculty. They have a 5-day certification program that is well worth the time and expense. Like GID, the NSRF protocols are most effective when understood thoroughly and adhered to completely. I have given you a taste of 3 protocols, but I haven’t really gone in to the detail necessary for them to be truly powerful. I would recommend finding a way to either attend one of their open training sessions or get your school to bring in one of their staff to do the training. Their is also a great book by Ron Ritchhart that talks about a very similar idea of thinking routines, Making Thinking Visible. His routines are generally a little less structured and focus on bringing the thinking to the surface. There are a number of routines that are the same as the NSRF protocols and it is interesting to compare how they are described by each author. This book is definitely worth checking out. The maker movement is something that has been surfacing in conversations in so many ways, especially in the library world where it seems to be “the new thing” to have a makerspace in the library. I was given an opportunity to conduct an action research project exploring making and it’s relationship with inquiry, specifically within a library context in a single-gender, boys’ school. I delve into this topic more on my own blog and in a chapter of the upcoming book on GID for High Schools, but there are some important comments that can be made here. Both making and inquiry exist on overlapping continua. In inquiry, we typically start with a question. That question gives us the direction as we explore and learn and then eventually share the results of our inquiry with others. Making on the other hand, often starts with the end result in mind. We are going to build X. What do we need to know to be able to do that? We constantly work toward a known end-point. All inquiry that is to be shared with others, requires that something be made in order to communicate our learning out. And all making requires the investigation of questions that allow us to build the knowledge and skills in order to complete the making. I see a sweet spot in the understanding of this relationship that we can use in designing GI units. We have the ability to focus student attention on the kinds of thinking that we need them to do. If we care more about the actual content of the inquiry most, then we can delay discussion of the mode of sharing of our knowledge. This frees the students up to spend their time thinking about their inquiry and developing their story before they figure out the most effective way of communicating that story. If the mode of making is important, such as introducing a new tech tool to a class or working specifically on essay writing skills, then the focus can be put in this area instead of the actually content of the inquiry or time can be allotted to addressing those skills at the appropriate time in the Create phase. Perhaps the inquiry is around the making itself such as coding or communicating through infographics, in which the entire design of the inquiry unit is focused on the Create phase. Regardless of how you use making in your GID, you do need to give it some thought as the making itself colours the entire nature of the unit. As we have all experienced, that research essay that starts with, “you will write a 5,000 word essay on…” focuses student thinking entirely on the number of words of the essay and the content of the essay is relegated to a position of lesser importance. The same project approached from a, “we get to explore…” which is followed some classes later by “… and we need to share your research through a formal academic paper, 5,000 words in length.” Is a completely different experience. We also need to ensure that we allot enough time for the making, especially when we are looking for creative, student-directed modes of making. If we want students to push boundaries and take risks in their making, they need the time to learn the making skills required and be given time to recover from initial failed attempts. Finally, I have observed or experienced a number of challenges implementing GID that I’d love some feedback on. As Leslie observed in her comment to my last post, GID is an evolving model and no two implementations are going to be identical. New situations, challenges and experiences emerge each time even when doing the same unit with a new group. This is what makes GID truly responsive to student needs, and more challenging than the old paradigm of the “if it ain’t broke, don’t fix it” defined research question approach. Cross-discipline units are hard to design. One struggle that I’ve had is the paradox between GID isn’t about content and it’s completely about content. I love the fact that students blaze their own trail through the broader content, but the broader content has to be well-defined. The challenge comes when we have a cross-discipline project that doesn’t necessarily share the same content needs. An example is the “What does it mean to be human?” exploration that I wrote about previously. This question looks completely different when viewed with a Social Studies lens than it does with a Science lens than it does with an English lens. How do we assess something like this in terms of it’s content? Our group asked students to attempt to draw connections between the subjects. That was moderately successful, but depending on the topic, some of those connections were truly a stretch. Even getting the various subject teachers on the same page as to what they need/want to see out of the unit can lead to some interesting discussions. When you have a Science teacher faced with a curriculum that has many very specific content items that need to be “covered” and an English teacher who’s curriculum is much more open and skill-based, it can be an interesting discussion when trying to find common ground. I know that this particular unit is not unique in this way and I’d love to hear perspectives on this. Speaking of teachers… It is also interesting to see where teachers’ comfort levels are with student control over content. Even the most open and “cutting-edge” teachers I know have admitted that when push comes to shove, giving over so much control to the student in selecting the content of the inquiry is uncomfortable. We all grew up in a paradigm of the teacher controlling the distribution of content and we still live in a world where standardized tests are the measure of success in learning. No matter how vehemently we believe that these paradigms are simply wrong, to do a complete 180 is tough. When a teacher has taken the risk and experienced a GID unit, most of the fears subside and they realize that much of the content (sometimes all) takes care of itself. What isn’t addressed in Immerse often surfaces somewhere in the students’ own work. But how do you convince your colleagues to take the leap? How do you tell that teacher in a content heavy course with a Provincial or State exam at the end, that everything will be OK (maybe even better)? That’s all, folks! Thanks to Leslie for allowing me this opportunity to reflect and share. I hope that my writing has been of some use to someone. I look forward to reading the others who are sharing in the coming weeks and hope that conversation around each of the posts grows over time. See you ’round! And come visit me at my blog! In my last post, I gave you some context as to what my school is about and how I came to become a GI disciple. Today, I’d like to get into how we’ve leveraged Guided Inquiry at my school. These are certainly not the only instances of GID that have been used at my school, but these are all ones that I’ve been involved with in some way and illustrate some of the successes and challenges that we’ve faced. As a precursor, it is important to know that my school has been considered one of the top schools in our Province (some would say country) academically as measured by scores on Provincial and Advanced Placement standardized tests and the kinds of schools that our graduates get admitted to. We recognize that we have done extremely well in an older educational paradigm and that as student needs change (and Provincial curriculum changes to match) high academic standards as measured by standardized test is only a small part of what we need to do in the future. We need to go beyond the covering of content and go deep into addressing how students think. This means that we are spending more time uncovering content than covering it and are emphasizing helping students learn for themselves rather than simply teaching them “what they need to know.” This has precipitated a number of shifts in what the work of the classroom looks like (and what the classroom itself looks like) and has brought in Guided Inquiry alongside of Project Based Learning, Harkness discussions, NSRF Protocols and the Visible Thinking ideas of Ron Ritchhart among other things. This has meant that, at times, some ideas from each of these arenas seep into teachers’ practice while at other times, entire pedagogies are adopted as a whole. You will see below that some of these implementations of Guided Inquiry rely on some of these other ideas and some are more loosely based on GID leveraging some of the key components, but not the entire system. As I stated in my previous post, there are so many great ideas within GID that taking parts of the model will improve teaching and learning but adopting the entire model will transform them. Our first run at GID was motivated by my trip to see Leslie in Boston. I’d done the reading and I’d bounced ideas off of Leslie. But I thought that I wouldn’t truly understand until I got my hands dirty. Boy was I right. My teaching partner in this unit, Christina Tutsch, and I were completely naive. We looked at the number of classes we had before Boston and said to ourselves, “8 phases = 8 classes! Easy peasy!! !” It didn’t take us long to figure out that that was mistake #1! We started with a brilliant Open phase. Our topic was looking at Canadian identity in context of the immigrant experience. Historically, our Social Studies 10 curriculum leads up to the founding of our nation in 1867 and waves of immigration from various parts of the world played a significant part in our history up until that time. But of course, we didn’t simply close the doors on July 1st, 1867. We continue to have immigration stories impacting our nation and national identity. Given that we live in a very international city and our school has a significant boarding community, many of these stories relate very directly to our own boys. We opened with the viewing of a piece of Poetry as written and recited by Shane Koyczan at the opening of the 2010 Olympics entitled, We are More and then viewing an ad by a national beer company, I am Canadian. From there, we had a discussion about what it meant to be Canadian. I poked and prodded and tried to incite some argument. My students are so polite. But I did get them thinking about the possibility for one person to be more Canadian than another; if it was a piece of paper that made someone Canadian or something deeper. In conjunction with some basic dissemination of content knowledge around particularly key points in our history where immigration patterns had particular influence, the students did their own brief research via Wikipedia and broad web searches in order to build a timeline of immigration to Canada. This allowed the class to have a common jumping off point for their own research that was followed up in the ensuing Explore phase. By this point the students were fully on board with the topic at large and were beginning to see connections to their own lives, whether it be Chinese-Canadian students taking an interest in the Chinese railroad workers that were key to building the trans-Canada railway to students who were interested in stories of parents who weren’t able to practice their chosen profession in Canada because of archaic laws and the broader implications of discouraging highly trained professionals from immigrating to Canada. The identification phase was done informally as one on one discussions about topics where teachers helped to refine student ideas. It was through Explore and Identify that the folly of our “one class per phase” really started to surface. Students who immediately saw connections that interested them had little problem outside of refining their ideas. Students who wrestled with this more took much longer and required more time outside of class. Luckily, with this particular cohort, we had some flexibility with their schedules and could rob time from other places to give them more on the project. Another bit of fun that we had with them was that we regularly teased them about the end product for their research. I would say, “You do recognize that we haven’t told you anything about how you are going to share your research with each other…” And then I’d dismiss them. The result of delaying any discussion of the final product was that the students focused on the story rather than how many words an essay would have to be, or some other product related concern. The discussion at the end of Gather became around how best to tell their story. The boy who’s father couldn’t practice his profession in Canada wrote a letter to the Prime Minister addressing the issues that immigrant professionals face and offered some possible solutions. Others did audio, podcast-like presentations. Others did more traditional writing. The end products weren’t quite as creative as we’d hoped, but then again, we didn’t really give them much time (one class!) to explore these options. Sharing and Evaluation occurred primarily through their blogs as they read each others’ work and commented. The nice thing about the blogs was that they were using the same blogs as their Inquiry Journal so the final product was published as the summary to a longer line of published thinking. The final de-brief on content and process, which was held as a larger group discussion revealed some great connections and the affinity that the students had developed for the GID model. A brilliant first time out of the gate, even if we did cheat things and not quite give enough time to really flourish. More recently, we used elements of the GID model for a full grade exploration around the question of “What does it mean to be human?” This unit involved 150 Grade 8s and 10 teachers including myself. It was addressed as part of their English, Social Studies, and Science classes and was purposely broad to allow connection making between the subject areas. The execution of the project offered some challenges from the get go, but ended up in some very powerful learning and some very excited students. This is a new configuration of our Grade 8 programme at our school, so there are many aspects of our work that are still in “beta testing” mode in terms of how we organize for teaching and what connections between subjects can be leveraged, and as this was our first cross-discipline inquiry project, there were many issues to work around. More about those next post. Suffice to say, it took some time to get all of our ducks in a row and the Immerse phase had really begun before we could organize an actual Open activity. We dealt with this by having students start doing regular reflections in their individual classes on a regular basis so that they could at least start to draw some connections between the disciplines and pull personal meaning out of the content. The result was that we did get some good connections with course content that might have been lost if it was dealt with in a more traditional manner. Having said that, by the time we got to the Open activity, which was an Affinity Mapping protocol (from the NSRF protocols), the students were already thinking in a very discipline-centric manner. It was hard to break them of that after the fact. This was another unit that was pressed for time – not as much as the Social Studies 10 unit described above, but still squeezed in. There were a lot of pieces that the students were asked to do along the way. They completed a worksheet that had them develop a driving question and research questions that supported the driving question as part of the Explore and Identify phases. They were regularly journaling electronically and their teachers had access to these. They did a check in and final Annotated Bibliography as their Inquiry Logs and they did peer-review forms and worksheets to get them to analyze their sources of information more critically. We packed A LOT in in a few short weeks. The end product was of their own choosing with the stipulation that it had to stand alone (no explanation required from the student) and had to maintain an audience/reader’s attention for about 5 minutes. Given the lack of time, we got a lot of poster boards and Power Point presentations. The students tended to go with formats that they were already comfortable with, rather than identifying the best platform for delivering their message. There were exceptions in the form of films, infographics, sculptures, 3D models, but those were more the exception than the rule. The sharing was all done on one day. During their class time, peer groupings of 4-5 students came together. The presenter displayed their piece and then there was written and verbal feedback from the other students. Later on that evening, we had parent-teacher interviews and the boys took over a few classrooms and displayed their work for their parents. It was fascinating and encouraging to watch the parents not only find their own son’s work, but to see how many of them spent time looking at other projects and discussing them. All in all, the projects pushed the students’ thinking and, even in the short amount of time that we gave them, gave them cause to explore something that genuinely interested them. Each teacher had a smaller group of students that they were “advising.” Many of the students that I worked with talked about how they might further explore their topic, even when the final reflection piece didn’t actually ask if they would. We have a number of folks who are actively working with GID or ideas from GID to enrich their students’ learning experiences. Topics that are currently on the go include: relationships in the context of Romeo and Juliet, creative writing around global issues, and revolutions throughout history. Other ideas that are being bandied about include programming paradigms in computer science, coaching techniques in a physical education class, privacy and security in the context of Cory Doctorow’s Little Brother. Comments and questions are always welcome and I will respond! 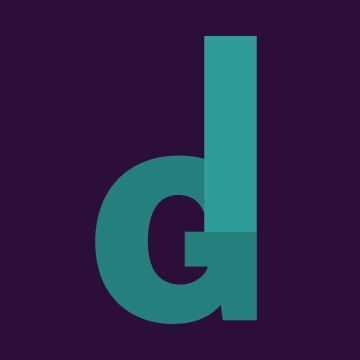 My next and last post will be around connections, challenges and bigger ideas connecting to GID. See you in a couple of days! This is SO exciting! Our blog sharing begins this Sunday. Here’s an update on the weeks to come. Below is our schedule from January through July. You will notice that we still have a few weeks open. Follow the links on the chart to sign up and join our challenge! We have many weeks open in August, September, October, November and December- so, sign up if those dates fit your schedule and you’d like to join the movement! I plan to post the schedule for August through December in July so we have time to fill the extra slots. There’s now an RSS feed and a way to sign up – on the right side bar – with your email so you can get notifications in your inbox of new posts! Don’t forget to sign up there so you won’t miss anything! Please share this with your colleagues and educator friends! The more the merrier. And don’t forget to have conversation here in the comments section. We should be able to get some great conversation going! This is an exciting start- for sure! Stay tuned! And follow these folks on twitter- here are their handles. May 29-June 4 OPEN WEEK SIGN UP! June 26-July2 OPEN WEEK SIGN UP! Week 27 July 3-9 OPEN WEEK SIGN UP! Inquiry based learning, What is it? Inquiry is generally considered as a formalized asking or an investigation through questioning. Research is the means by which we can systematically answer these questions by tapping into the body of literature and research that has come before. Through research (scientific or literature reviews), we test theories, discover ideas, generate new thoughts or hypotheses and create new solutions to problems. Because of the post-industrial information age in which we are living, it is ever more important that students learn how to ask important questions, find answers to those questions to create new content and participate in the global conversation in meaningful and intentional ways. It is critical that students have regular opportunities to ask questions and have the time and resources to dig deeply enough into these questions to be able to create new understandings and content worth sharing. Guided Inquiry Design supports students to learn the content of the course, curriculum or unit through inquiry and research. The process supports students to learn how they learn through inquiry. 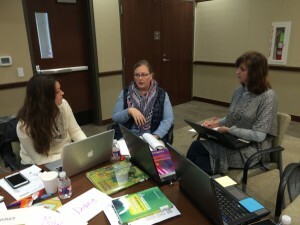 The collaborative learning team provides the underpinnings needed connecting to standards and curricula in order to design learning experiences that support students to construct their own understandings. The learning teams collaborate and design learning experiences for students that address core literacy, content, and social learning outcomes. Through teacher collaborations with school librarians, information literacy skills are taught within an authentic context using the Guided Inquiry process providing students with “the why” alongside “the how.” Students learn about information literacy concepts and resources, as they need them, to answer their real questions about what they are learning. This promotes deeper learning and transfer of these skills and knowledge to other situations. A new study out recognizes how teacher collaboration boosts deeper learning (Ronfeldt, Farmer, McQueen & Grissom, 2015). People are recognizing a great need to provide students with structured opportunities to reflect on how they learn through inquiry and research (Jacobson & O’Keefe 2014). Guided Inquiry includes regular self-reflection on student’s thoughts, feelings and actions as they go through the phases of inquiry. Implications from the research on the ISP show that students benefit from guidance during research, especially when students are learning about the process (K-12). The Information Search Process indicates specific areas where, without guidance or knowledge of the process, many students may give up finding the deeper knowledge on their own, as they may get frustrated exploring the vast amount of information (Kuhlthau, 2004). It is important for schools to support students to understand and recognize the inquiry process so that they may become independent to search for deeper meaning. This deeper understanding of “how I learn” through my own deep questions is a key component of a skill set for participation in the digital landscape, to enhance life, citizenry and grow academic abilities. 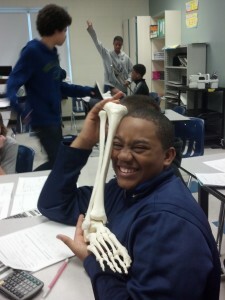 In Guided Inquiry Design we include embedded inquiry tools throughout the phases of inquiry to support students’ meta-cognition about learning how to learn through inquiry so that students who participate can know the process and become flexible and independent in their use of tools and strategies that support them to dig deeply to answer their questions. 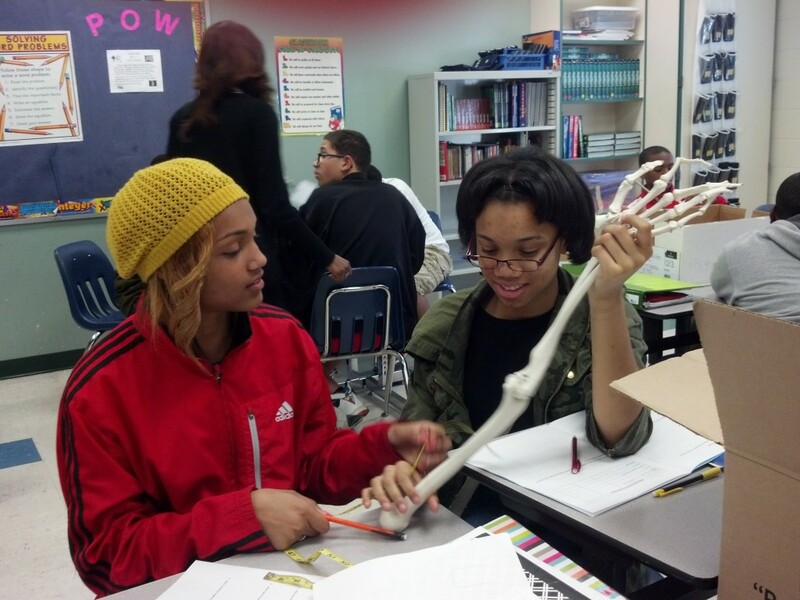 In a school dedicated to deeper learning, Guided Inquiry is the main approach to learning curricular content in science and humanities. An inquiry approach fits schools that employ educators who believe in a constructivist pedagogy (Kuhlthau 2004). In general, constructivist agree that humans learn through constructing their own understanding, not through “give and get” learning scenarios. Inquiry learning is active. Students are full participants in the learning as they ask questions and wonder. They are not considered passive recipients of knowledge. Inquiry learning requires students to construct understandings, participate, actively question, think, connect ideas as they grow an academic mindsets. The most effective classroom model for a constructivist approach is the workshop model. Guided Inquiry uses a workshop model for inquiry. Inquiry learning includes individual knowledge construction within a social context of learning. Each individual student constructs their own understanding as ideas and concepts are connected to what students know about the world. Misconceptions are addressed and sorted out through a social context and discussion within small groups, pairs, and within the inquiry community. In working with teachers across the country, we have found that teachers with a canned program of lessons must still spend time unpacking those lessons to effectively teach them to their students. These canned programs can tout that they address Common Core and other curricula and standards, but teachers still have to break these lessons down in their planning to effectively teach them to their students. Teachers at the school level know the students, what they know, and what content requires proficiency. This core team can design meaningful units of study having a greater impact on student learning. When learning is intentionally designed in this way teacher and student engagement is heightened and relevance is clearly made. In this way Guided Inquiry gives the teachers control over what is being taught and how it is taught. Teams are more able to plan effective lessons out of that design. With the knowledge of Guided Inquiry Design and theory, educators in collaborative teams can map out concepts, knowledge and skills that are addressed across the course, unit, term or even year. Together they determine the big picture concepts that all students will come away with and identify the learning objectives that support all five kinds of learning through the study. The team together determines formative assessments of progress along these learning targets. The assessments are determined in the design of the inquiry and used to track students meta-cognitive learning about how they are learning as well as literacy development, understanding of content goals, information literacy skills and concepts as well as growth in social contexts. Schools that use this approach need to provide teachers the time to design learning experiences that will support students learning goals. Informal studies of teams that I have worked with have compared results of traditionally taught material to that of students who learned through their carefully planned Guided Inquiry Designs. The results from these teams were worth noting. Students learning through Guided Inquiry Design performed much better on end of unit tests and state standardized tests on the same content following the study. Kuhlthau, C. (2004) Seeking Meaning. Our challenge is growing in membership. We have already 20 people signed up for 20 weeks. I will be taking the first weeks to set everything up. Here are some stats to show how we are shaping up! We have a great well rounded group with all levels K-University represented, new people to Guided Inquiry, some who have been at it for years. We also have teachers, librarians and district level leaders! This is great! Here’s the breakdown. We have 4 educators from the elementary setting! 4 from middle school and 4 at the high school level! How did that happen? We also have 2 people in district level library positions so we’ll get some systems perspective. We have 2 people in academics who are getting their PhD and including Guided Inquiry in that work, one is from the US and the other from Finland! We also have one university lecturer from Australia who weaves GID into her university courses on library science and is going to share her community blog of GID in Australia with us! People with a * next to their twitter name have participated in the 3 day Guided Inquiry Design Institute. They have had a high quality training in the Design either at CiSSL or in their district, led by me! US States represented (so far! )- Maryland, Wisconsin, Ohio, Oklahoma, Virginia, Texas and Nebraska. Stay tuned! There’s much more on the way! 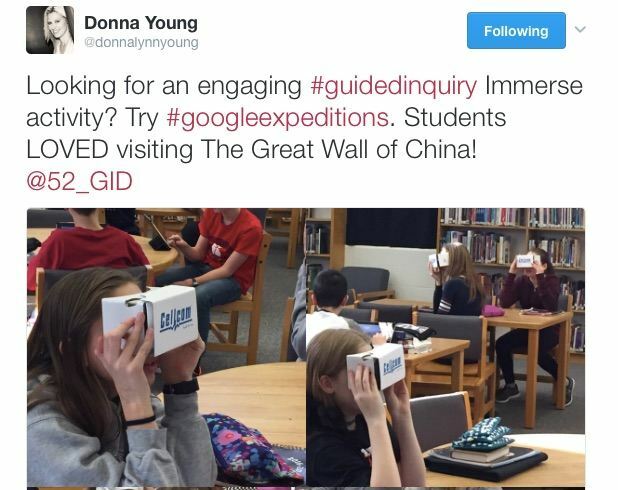 What is Guided Inquiry Design? The Guided Inquiry Design process is grounded in research that tracked students engaged in a research project for school. 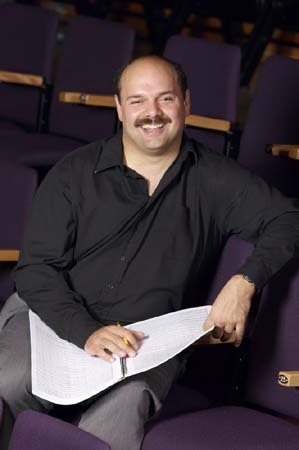 Kuhlthau discovered a process through observing, listening to and conferring with students during their research. What she found was that there were distinct phases that students go through and students had certain thoughts, feelings, and actions while going through these phases as they determined their question and constructed their own understanding. If they weren’t able to go through all the phases, due to time or other constraints, then the results included cut and paste, fact finding, and regurgitation of information. She found much, much more about this process as she studied this process for years and wrote about it in internationally acclaimed research papers. One thing she uncovered through this research was what kinds of supports students needed to go through this process, learn about themselves as learners, and how educators and librarians could intervene during this process to support students to successful knowledge building. 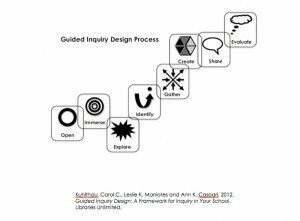 Our Guided Inquiry Design model was first written about in 2007 with Guided Inquiry: Learning in the 21st Century where we described the research behind the design and answered why it was important to move to a new form of school learning in this post-industrial era. 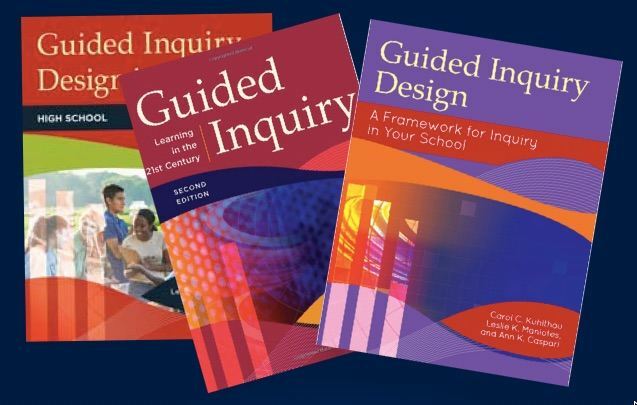 It wasn’t until 2012 that we came out with the complete program in Guided Inquiry Design: A Framework for Inquiry in Your School. This approach, since it was developed, continues to be implemented, and grow and evolve as educators use the framework to design units of inquiry study. I’ve trained more than 1,000 educators in the design through professional development at districts and schools across the United States and Canada. 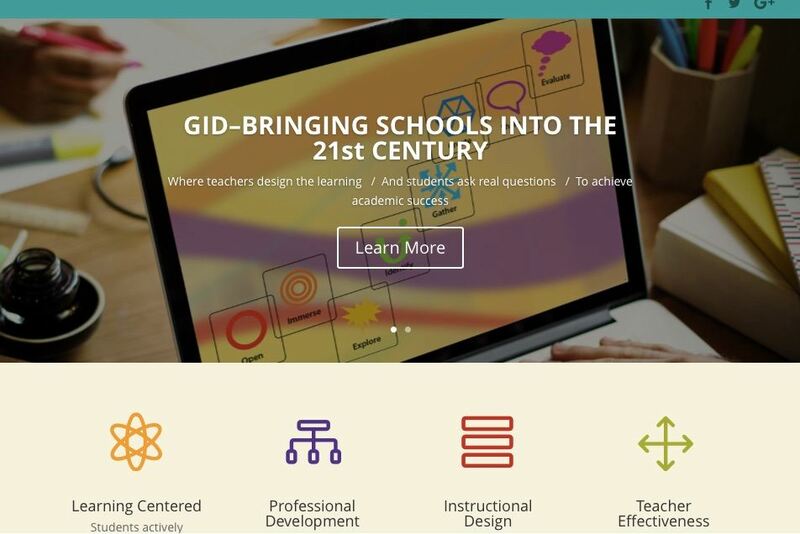 Educators in Canada, Sweden, Finland, Australia, New Zealand, Japan, Holland, Brazil, Columbia and many, many more have also been working for the last 3 years or more to implement this design for inquiry in all different kinds of settings, and finding Guided Inquiry the way to improve student learning for so many reasons. I am so excited to have this opportunity of “52 Weeks of Guided Inquiry Design” to have all these variety of voices come together in this space to share this transformative practice with the world! Thank you for being a part of this movement and for seeking research based approaches to teaching that have a lasting impact on deeper learning for all students.